What in the Wide, Wide World of Sports? : Jim Croce Lives! ROCHESTER, MA- In what can only be described as one of the most elaborate hoaxes in history, it appears that singer/songwriter Jim Croce is still alive! 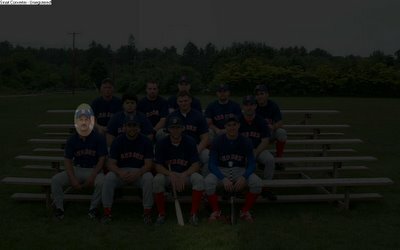 New evidence has surfaced from a small southeastern Massachusetts town in the form of a photograph, taken in 2003. Mr. Croce, a popular singer during the late 60's and early 70's, had allegedly died in a plane crash over Louisiana in 1973. The pilot of that plane had suffered a massive heart attack while in the air, and there were thought to be no survivors. But new photographic evidence has come to light from the town newspaper's archive, causing a renewed interest in discerning the truth about what happened to Jim Croce. Apparently, while living under the psuedonym Jim Walker, Mr. Croce was a player/coach for the Red Sox team in a summer wooden bat league.The photo in question belongs to one Adam DiOrio, who claims he had no idea as to the true identity of his coach. "One of the guys on the team told Coach that he looked like Jim Croce. Half the team didn't even know who Jim Croce was. I just told them all I felt sorry for their mothers. Anyway, Coach just shrugged it off." 'A lot of people look like famous people,' he said,'Doesn't mean they are those people.' Although Mr. DiOrio provided the picture, he could not comment on the current where-abouts of 'Jim Walker.' "Who knows?" says Mr. DiOrio, "He could be anywhere. He would just show up for games, play and then take off when it ended...he never came out for beers with us . I think its pretty cool though...like a Big Foot sighting or something." While this man has yet to be confirmed as Mr. Croce, he did assume the name of one of the characters from a Croce song; Jim Walker. But why did he fake his own death? What did he have to gain? And why would he leave us that name as a tantalizing clue? If this is in fact Jim Croce, he will have a lot of explaining to do. We are currently exhausting our databases here at the Wide, Wide World of Sports in an attempt to find more pictures of this man. If anyone out there has information that would be helpful in this investigation, please alert us immediately through the proper channels. We will have more updates as they appear. 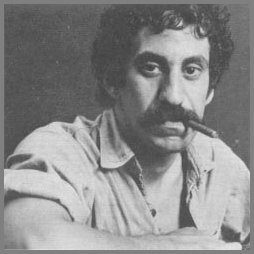 Until then, keep your eyes peeled for Jim Croce...he walks among us.